“Create a consistently compelling Downtown experience. ￼￼￼￼￼￼￼￼￼￼￼￼￼￼￼￼￼”Establish a downtown sports district that includes a new Vikings stadium. 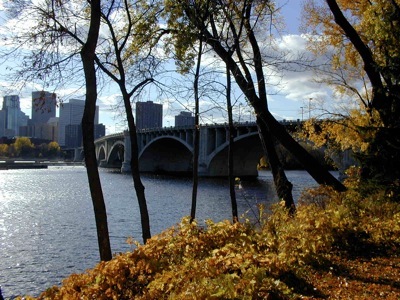 “Create and sustain a green infrastructure—and showcase the riverfront. End street homelessness. Extend housing and outreach efforts so that the 300–500 people who sleep outside or in inhumane places have shelter, treatment and job training that keep them off the streets. Launch a Festival of Ideas and Civic Engagement. An annual festival will bring visitors, innovative thinking and civic energy to a city already noted for its citizen involvement. The festival will focus on creating a better future for all—locally, nationally and globally. [Comment: The 345 MB version I have have 10377_PlanBook_forWeb.pdf has some production problems, duplicated pages, and pages out of place, but I did read all 111 pages of it (most were pictures). Otherwise, it is very attractive and fairly well written as planning documents go].